Summary 2-bay dual-core ARM-based RAID 1 class home & SOHO NAS for data backup and entertainment. I recently reviewed Synology's entry-level DS216j two-bay NAS. So it's only fitting to give QNAP a shot at showing what it can do for folks on a limited budget. The TS-228 is QNAP's cheapest two-bay product, joining the TS-231 and TS-231P in its SOHO / Home family. The product table shows QNAP uses three different processors in its entry-level two-bay line. I'll reveal what's in the TS-228 in a bit. As an entry level NAS, the TS-228 has a single Gigabit Ethernet port and one each of USB 2.0 and 3.0 ports and the drives are not hot swappable. The full version of the above table is here. 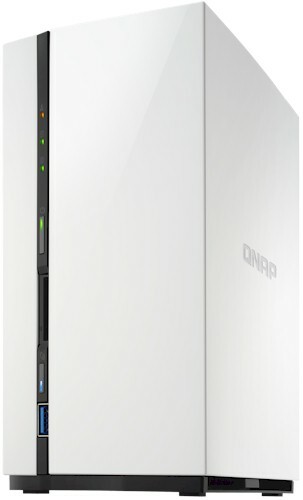 I'll be comparing the QNAP TS-228 with the aforementioned Synology DS216j Disk Station. The DS216j Disk Station is a logical comparison as Synology's entry level two bay NAS with very similar pricing. The chart below, excerpted from our NAS Finder, compares the major features of the TS-228 and the DS216j. The callouts below show the front and rear panel of the TS-228. The front panel has a single USB 3.0 port and a One Touch Copy button that lets you easily copy files to/from a flash drive. Located just above the copy button is a convenient SD card slot. The rear panel has a reset button, the single Gigabit Ethernet port, and the USB 2.0 port. The image below shows the component side of the TS-228's board. Removing the lone heatsink reveals the processor as a Realtek RTD1195PN. This is the first time we've spotted a Realtek processor in a NAS we've reviewed. Realtek doesn't have a public page for this device, but Google searches identify it as Dual Cortex-A7 SoC @ 1.1 GHz. It's also found in WD's My Passport Wireless Pro. You can't see it in the photo, but there is a blower about the size of a 2.5" drive below the board that provides some air circulation inside the enclosure. It produced no audible noise in a quiet office environment. The Table below shows the key component summary for the QNAP TS-228 and the Synology DS216j. The TS-228 drew 10 W with two of our stock WD Red 1 TB (WD10EFRX) drives spun up and 5 W in power save mode with he drives spun down. Fan and drive noise was rated very low. RAID 1 build time was ~ 2.5 hours for a 2 X 1 TB volume. QNAP NASes share a common operating system. The current operating system is QTS 4.3. The version on the TS-228 is 4.3.2.0128 and appears to have some minor cosmetic differences from the 4.2.3 version on the recently-reviewed TS-431P. You can read or download a comprehensive QTS brochure here. The image below shows the "Hamburger" menu and dashboard flyouts exposed. I've included a short gallery with several additional screenshots of the QTS 4.3 user interface. In addition, QNAP has an online emulator that will let you interactively browse the user interface. Note: The emulator is running on a higher end QNAP NAS. So not all features found on the emulator, such as 4K video transcoding and virtualization support, will apply to the entry level TS-228. QNAP has an extensive library of installable apps including the Plex media server. All of the installable apps are shown below. However, a noteable omission is an antivirus app. Complete specifications for the TS-228 can be found here. Firmware version 4.3.2.0128 was loaded onto the TS-228 and performance tests were run using the Revision 5 NAS test process. All tests were run using Western Digital Red 1 TB WD10EFRX drives (x2 SNB supplied). The benchmark summary below compares the QNAP TS-228 and the Synology DS216j. Note that the TS-228's File Copy Write throughput was significantly lower than the DS216j's throughput for both RAID 0 and RAID 1. In fact, the only non-backup performance test where the TS-228 outperformed the DS216j was for RAID 0 File Copy Read. The Synology DS216j doesn't have any USB 2.0 ports, so no USB 2.0 backup tests were run for the Synology NAS. For the USB 3.0 backup tests, the TS-228 outperformed the DS216j for both EXT3 and NTFS formats, but the DS216j held a slight edge for the FAT format. For the network backup test, the DS216j (46 MB/s) was almost twice as fast as the TS-228 (26MB/s). The TS-228 lacks support for iSCSI, so only the results for the DS216j are shown. The chart below shows the Total NAS scores for the four least expensive two-bay RAID 1 NASes. The QNAP TS-228 has a Total NAS ranking of #18 compared to the #5 ranking for the Synology DS216j. The subcategory rankings show the only category win for the QNAP TS-228 was for backup. Looking at the benchmark summary comparison above, it comes as no surprise the Synology DS216j had significantly better category rankings in every other category. The DS216j had a particularly strong showing in both the Write and Video benchmark categories. In the previous review of the QNAP TS-431P and Synology DS416 entry level four-bay NASes, performance was pretty much of a toss-up, most likely because both NASes were using the same Annapurna CPU. But in the case of these entry-level two-bay NASes, the Synology DS216j, powered by a Marvell SoC is the clear performance winner over the Realtek-powered TS-228. The NAS Ranker for RAID1 products sorted by price shows that there's not a less expensive NAS with better performance than the DS216j. The next best-bang-for-the buck two-bay choice is the DS216j's more powerful sibling, the #3 ranked DS216 currently priced at $191. If you love QNAP products and are looking for something with better performance than the TS-228, your next best choice is the #7 ranked TS-251.